First, a big ‘Thank-you!’ to everyone who made our day such a great success!!! The weather in Perth was beautiful and sunny – blue skies and warm sun, it was a perfect day to visit the Perth Fair. We arrived early to set up our booth and many thanks to Steve Brown of the Perth Fair Board for his help with our preparations over the past weeks and for his warm welcome to the Fair yesterday. We met some great folks who were our neighbouring vendors in the Commerce building. Our neighbour to the left a creative and talented wood carver from Killaloe and Jolene our neighbouring vendor to the right with her vintage Rawleigh products and we shared many great moments and many laughs and fun during our day which ended too soon. Both books were good sellers and some folks brought in books they had previously purchased to have them signed. 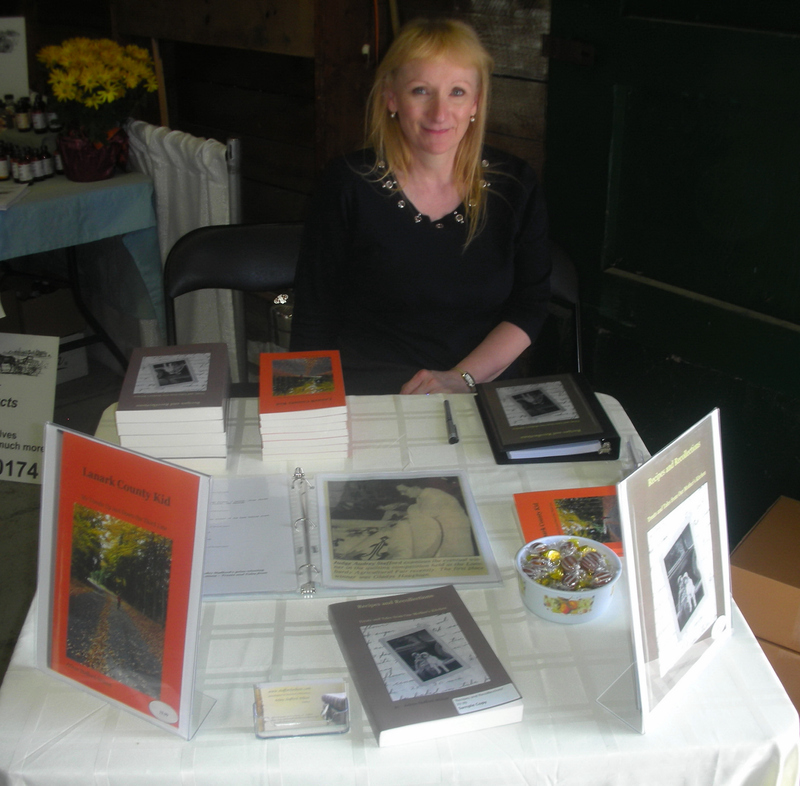 Thanks to everyone for your enthusiastic support and great reviews of ‘Recipes and Recollections’ and ‘Lanark County Kid’. A special thanks to many old friends and neighbours who dropped by our booth to say hello: Art Perkins, our former next-door neighbour, Mavis (Jordan) Wollam and her husband Rod, Lyle and June Conroy – Lyle, a long-time member of the Fair Board and June – who worked with Mother as a fair Judge in Homecraft for many years. It was great to see so many faces from the Third Line – Janice (Jordan) Gordon and husband Randy Gordon, Elaine Morrow, Sylvia ‘Sib’ Turnbull, Trina and Sawyer,Wayne and Margery Conboy and Susan Couch. Diana Conboy and her husband – congratulations on your recent nuptials! It was a delight to finally meet Wanda Murphy and her two beautiful girls – who also grew up in our former home on the third line. My cousin Peter Stafford also stopped by to say ‘Hello’ and show his support – it was great to see him again. A big ‘Congratulations!! !’ goes out to Margery Conboy – Winner of ‘Most Points in Baking’ for 2012! Her baking looked positively delicious – tarts, cakes, many pies, cookies – all looked very tempting as they were displayed in the Home Baking section of the Homecraft Building. The midway had a good variety of rides for different age groups. There were lots of tasty hot food selections from the various food vendors and all of the staples we love at the Fair like the candy apples and cotton candy. The displays of local maple products, bottled goods, crafts, needlework, flowers and photography were great. There was a good turnout for the lawn tractor races and tractor pulls and the many displays of calves, chickens, lambs and other animals attracted the crowds. As the day wound down and the sun set we were treated to the sounds of Pembroke native,country artist Jason Blaine, the dazzling lights of the midway and shrieks of excitement coming from the rides. As 10pm approached and the doors to the Commerce building were drawn together, we headed out to the car, sad to be leaving such a wonderful day at the Perth Fair! Thanks again to all who made the day so special! ← Countdown to the Perth Fair!